I'm pretty sure we are all struggling with this from time to time in one way or another. I'm definitely one of people who do it often. Not in a way, that I can't do things, just that I think about certain things too much. I'm a kind a person that likes to analyze everything from psychologial aspect: why is someone acting like they are, whats the background behind the whole story etc... Same goes for analyzing myself. I will go deep in everything even if there's no need for it. Sometimes it's really killing me. It's making me feel insecure. Imagine you are doing alright and you are subconsiously making yourself feel like you have some problem going on and you are over analyzing everything. It's going that far that you are feeling bad, but you don't know why or what you did to make that happen, because everything is just fine. Sounds a bit confusing but I hope you get what I want to say. The reason I wanted to share it with you is because I found a few ways to deal with it, so I wanted to share it. ➳ Talk about it! Support system is everything. Controling your thoughts and staying positive Is I think the most important thing of all. Controlling your thought is some kind of habbit, you just get use to it. At first it is hard, but it gets easier and it doesn't mean you don't care about something or someone if you don't overanalyze it. Remember that! How are you dealing with it? What are your tips? Please leave them in comments! 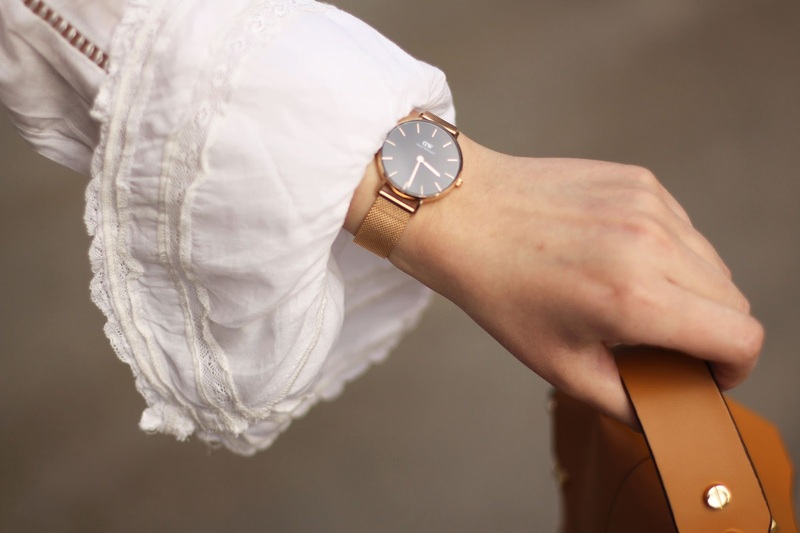 Use code VUKOSAVLJEVIC to get 15 % off on all Daniel Wellington products. controlling your thoughts and staying positive as much as possible is so important to me, too! it really changes the situation and perspective of things. I'm absolutely in love with this romantic blouse, especially the sleeve detail! These are great tips! I always overthink things and I try to follow the same things - I like to take deep breaths and let it feel as if it is all washing away. Kind of like waves. I think positive thoughts and it usually helps! First of all your blouse is gorgeous! I needed this post because I tend to overthink a lot of things. I think too much and it stresses me. I hate it. I've learned that writing helps me and catching myself in the act of over analyzing helps me as well. I'm learning to let go, and it's a life long journey but I get better each and every year. Thank you for this post! I am totally an over-analyzer and over-thinker! One thing I need to do though, is stay positive for sure! Love your skirt, it's so fun! Love the embroidery detail and gold shoes! You have no idea how badly I needed to read this post today! I am such a horrible over-analyzer, and my boyfriend gets on me for it all the time because he knows that it's just not healthy! Thank you for sharing your tips, I know I'll be putting them into practice! I know exactly what you're feeling here. I go through the same bouts of overanalyzing a problem from time to time too. I love your tips here for dealing with these negative feelings that often hold us back. Truth be told, certain situations are harder to let go of than others for me. With those situations where I know I can't just forget about it, I try and honor my feelings by allowing myself to feel them and usually I find after doing that I feel much better. Sometimes I just need to let it out and have a good cry and then I can get over it. I love this post! First of all, you are beautiful, and second of all, I can completely relate. I definitely think you do have to let things go. If I spent all day over analyzing things, I would be crying in bed 24/7. I think your tips are spot on and can help any one has gone through this or who is currently struggling with this! First of all, I love this outfit! Such a cute look! Also, this post was a great read for me as I tend to overanalyze. These are great tips for those who struggle with this! this is so true! thank you for sharing these tips.. this was a great read! The embroidered detailing on this denim mini is so freakin' gorgeous! Love this read. Love this casual outfit. Such beautiful detail ! And I love your message staying positive is so important. It can make or break any situation. What a cute outfit! I also love your hair color! Loved this post Story of my life! Making lists and writing everything down literally saves my sanity! I fly through notepads and sticky notes lol! This is awesome love it! I can totally relate to this post because I have a tendency to overanalyze and overthink everything!! I love the tips and pointers on how to keep it under control, talking to people usually helps put my mind more at ease versus bottling it up inside myself. 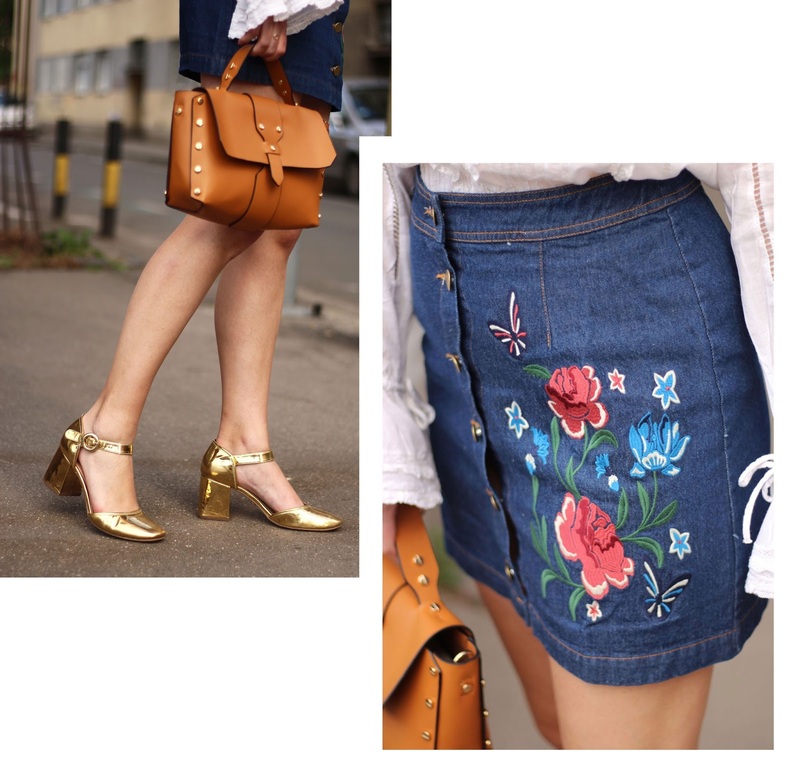 I adore your entire outfit, especially the embroidered denim skirt and those cool gold mary janes! such a great post!!! you make some fabulous point. I use headspace app to help when I'm stressing about things. it's great!! love your outfit too! THIS post was something I need to read. And all such amazing points. My biggest struggle is controlling my thoughts for sure. It's so easy for my mind to get stuck on something and it not go away for awhile. Thanks for this post girl! Staying positive and knowing that I can't control the future is HUGE. I overanalyze my future so much! I agree with all these tips, especially the last one. Staying positive is so important! That skirt is so cute!! also loving those shoes. Staying positive can do wonders, it can be hard but so worth it! I totally deal with this too so I can relate. You look amazing! My fiancé is notorious for overthinking things, so I'm going to let him read this post. I've been telling him some of these same things you said and he still does it. Maybe seeing it from someone else will make him stop doing it. Great tips babe! I definitely needed this post tonight ! I tend to overthink a lot of things and it only leads to stress! I am going to take your advice and write things down and let it go. I love your outfit !! I believe that being positive is really important! I actually same you analyze everything and everyone, because I used to be interested in psychology! I love your ruffled bell sleeved top! Thank you for such wonderful tips and positives vibes, such a great message!! I adore everything about your entire outfit, is so feminine and flirty!! I can see my self wearing it , too!!! loooove it! Love that skirt! The embroudery is so cute! Such a great look!! Love the top with that denim! And yes, I find talking about your feelings with those closest to you helps SO much in conquering those doubts and insecurities! You look so pretty in the skirt. I totally agree that sometimes we can over analyze everything we do. I have learned to let go and think positive by just doing me. I think everyone is guilty of over analyzing at times. I usually talk to my husband and mom about things, then think about it some more, pray over it, share it with my cell sisters then just let it go because it's not worth the stress and worry any longer. You have great tips tho! This top is amazing, love the sleeves! I agree on the positive thinking, I have troubles avoiding the negative vibes from my surroundings, constantly trying to work on it! Controlling emotions and keeping track of actions helps so much not to don't go wrong in certain situations. Just as useful to writing so make you more aware of what you do. I like your outfit, it's very cute. i can totally relate to you, I used to over analyse a lot in the past. i would often just get fixated on one thing and not move on because I personally just couldn't get over it. So I agree with all of your tips and that positivity is one thing that can help you feel better about the situation and feel more in control. Btw I love your outfit! And your long legs!